Why not bring your wooden boat (if you have one!) to Ontario and rent a cottage? The fall colours have begun to emerge, and the weather has been unseasonably warm. Lee’s Lakeside Lair, for example, offers a charming getaway for a very modest price. Privacy, peacefulness, sunlight and beauty are words that come to mind at Lee’s Lakeside Lair on pretty McQuaby Lake, just south of North Bay, Ontario. 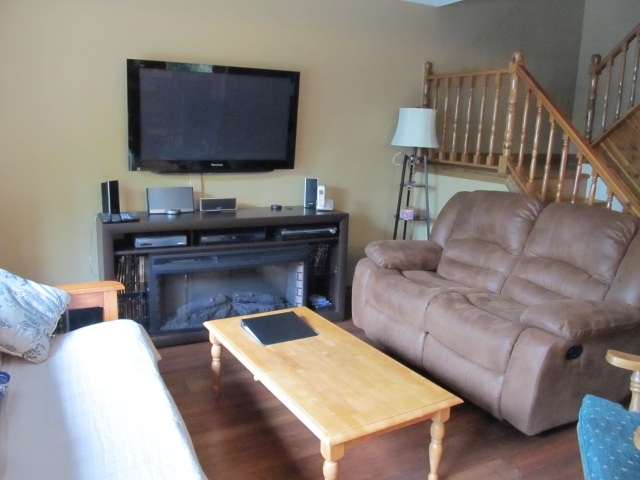 Situated on five acres of land, the three-bedroom, chalet-style cottage has a good-sized deck that faces the water to catch the morning sun or relax in the shade during the afternoon. 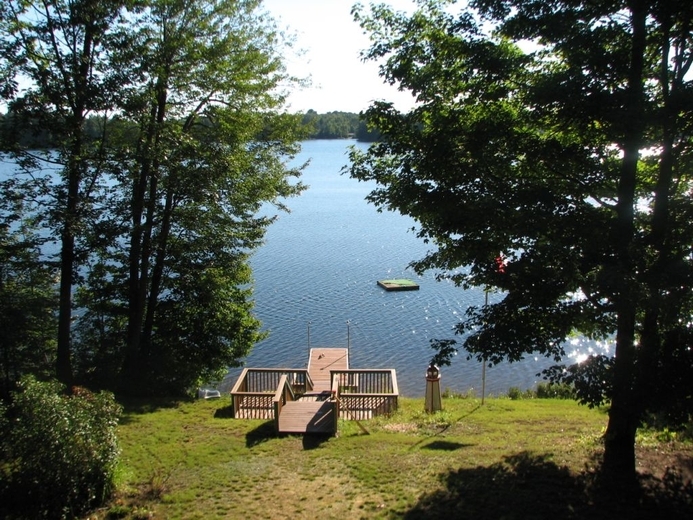 A second small deck off the upstairs bedroom gives the option of a private space to enjoy the lake, while a narrow deck at the western side of the cottage will satisfy the sun worshipers who are seeking the afternoon rays. If the weather is inclement or you require a screened-in option, there is a screened gazebo that also has a lake view. The large yard gives plenty of space for children to explore, and the woods around the cottage ensure privacy, wildlife sightings and natural beauty. The cottage has one bedroom with a queen-sized bed on the main level. There is a four-piece bathroom across from the bedroom. 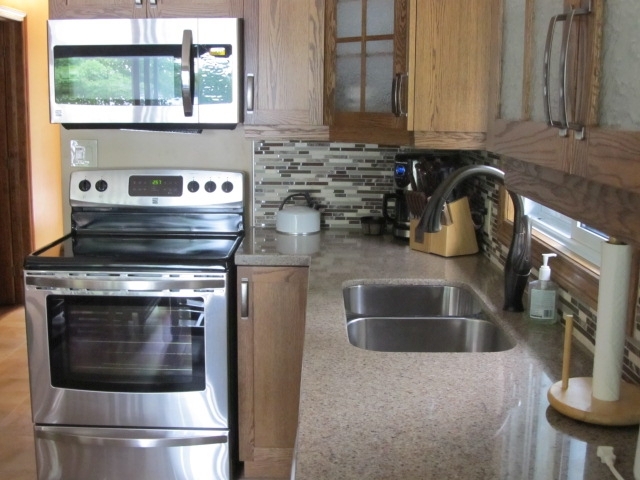 Also on this level is the kitchen with dining table, near large windows that give a lake view. 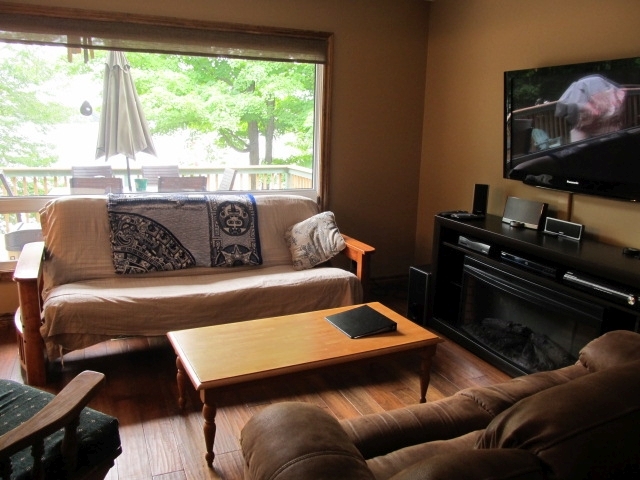 The living area opens off the kitchen and has comfortable seating, a lake view, and a large flat-screen television with DVD player. A door from the dining/living area accesses the twelve by twenty-four foot deck with its numerous chairs, barbeque, and table with umbrella. 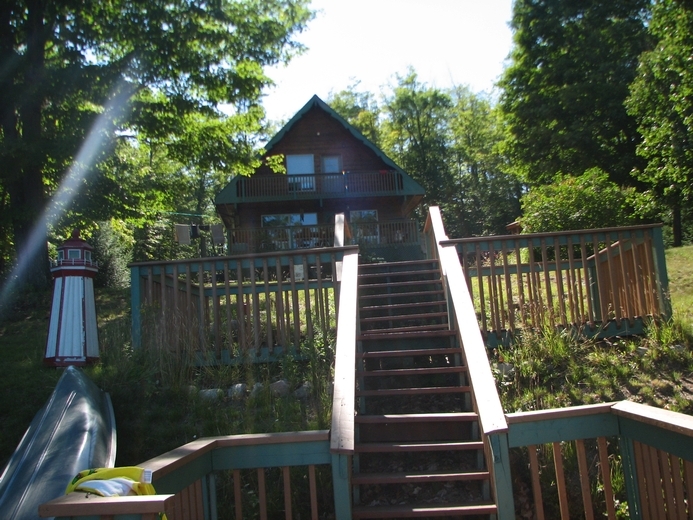 Stairs lead up to the second level of the cottage, where there are two additional bedrooms, and a second four-piece bathroom. Each of these have double beds. A door from the lake-side bedroom accesses a small deck. Leaving the screen door ajar at night will allow in both the fresh breezes and the sound of loon calls echoing across the water! Ceiling fans in both upstairs bedrooms will ensure comfort. At the front of the cottage, the level lot gives way to a slope that approaches the lake. Wooden stairs and additional decking lead to the water’s edge. From the lower landing, three steps lead down to the dock. A thirty-two foot dock runs off the staircase and extends out to where the water is about four feet deep. Non-swimmers may enter the water at the lake’s edge where it is shallow and the sand bottom is firm. There are some weeds on the bottom of the lake, but they do not interfere with swimming. A rowboat and canoe are provided for exploring the lake or for fishing. Along the lake there are areas of crown land and undeveloped areas that may be explored. A fire pit with wood provided is also available for guest use. 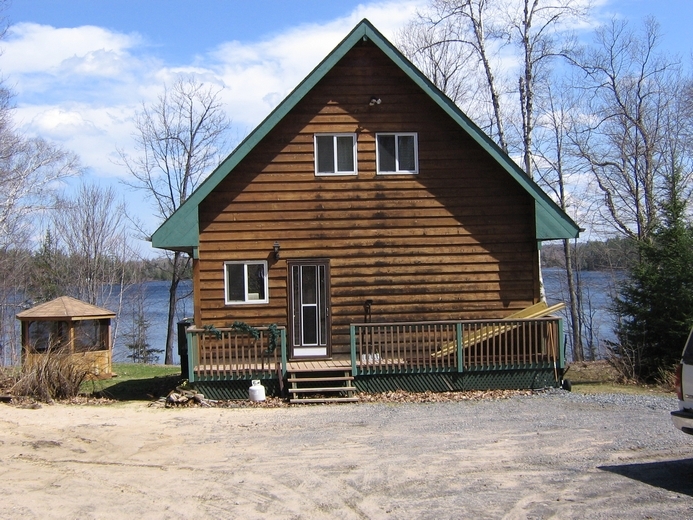 This cottage also makes the perfect winter getaway for snowmobile enthusiasts. The cottage is fully winterized. Restoule Provincial Park with its hiking, boating, and sandy beaches makes a good day trip from the cottage. The village of Restoule has a variety store and ice cream cone stand, while the town of Powassan has a grocery store and interesting hiking trails. Lake Nipissing with its extensive boating and fishing can be accessed near the village of Nipissing. A visit to the nearby city of North Bay could include a boat trip on the Chief Commanda, live theatre, restaurants, and shopping.